Yeah, I was thinking like a 2x3 base, with spots for at least four figures on the skiff. I like where the "transport" mechanic can go and what it can do for the game. 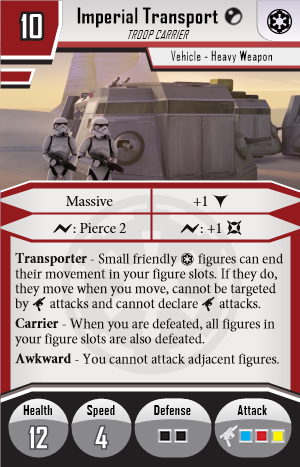 Maybe the "loaded" figures can't attack using their dice pool, but can operate the vehicle's guns, and the transport is unable to attack without any figures riding in it? Admiral Ackbar- a leader type like Jabba, more focused on supporting his troops than joining the combat. Maybe a special action that orders two friendly figures to move up to their speed. It could be called Trap Avoidment. Quarian black market dealer- the other squid head species, mercenary, and is able to play a support role, like Jabba, but with less potent abilities, and maybe a weak blaster attack, blue and yellow. General Weiss has General's Orders, so no need for a new name to that ability. I might also add- Crew needed: You must have at least one unit in a figure slot to perform a move action. You must have at least two units in figure slots to perform an attack action. Perhaps there should also be an option for boarding and attacking figures inside, too. Imagine dropping a boss character inside- an extra 12 health for them, plus the ability to get a double move in outside of their activation could be pretty brutal. A capital ship campaign, with tiles representing the interior of rebel and imperial capital ships along with figures and heroes that are "Naval" based. I've already suggested Naval Troopers for the empire and Rebels already have their Fleet Troopers. Not sure what else would go within the "Naval" theme. I've liked the idea of a Star Destroyer/Death Star campaign for a while, but I really like your idea of also having Rebel ship interiors- maybe on the inverse side of the Imperial ship tiles. A "hacker" hero with the ability to interact with Imperial heavy weapons and vehicles. Maybe a Bothan? 4LOM and Zuckuss: a two figure pack, like to see them with synergistic abilities (i.e. while Zuckuss is on the board, 4-LOM gains [insert ability]) and a focus on their foresight abilities, when defending, force the attacker to reroll, while attacking, the defender is forced to reroll, etc. I'd like to see a Bith, an iconic species that's been under represented thus far. This may be a bridge too far, but in Last Jedi, Crait was an abandoned rebel base. What if it got a little spotlight, and be able to earn one of the crystal dog things as a companion. Power of the pack: Can only use your first line of abilities when within 3 spaces of a friendly HUNTER. Once/group/activation they have access to these too. When any of the abilities is used you gain 1?power token. Advanced scattergun: You may spend power tokens during attacking to deal 1 damage to an enemy within 2 of target who you could attack. You may spend surges on these enemies too. Can use them any times/attack but only once/target. Maybe characters with at least 2 higher cost than threat level can perform moves to move the entire carrier and attack from the inside but they can only do one of these/activation. They sort of become drivers or gunners. Boarded figures should be able to heal 3 as an action but woud also need an action to get out to an adjacent space. Two black dice means that in early campaign it can entirely ignore imperial weaker figures like stormtroopers. But a droideka hero built around rolling around, shielding then shooting like mad would be very cool. 1 strain:Move spaces up to your speed then gain a shield token and focus. When defending with a shield token roll 1 extra black die. After the attack resolves, if it missed you might attack the attacker for 2 strain. When declaring attack with shield token your targets choose of having+1 evade or interrupt to move 2. Discard your shield token when you take damage or when you decide to do so. 2strain: attack two enemies within 3. Then they attack you as if they were one figure adding their dice and abilities together,even if they died. In dis case you roll the white die too. Right. Like a 3x2 model, with maybe 5 square spots for units to stand and 1 for a control panel or something. I like this idea, but I'd lean more towards the Nikto, as there are already two groups of trandoshan hunters and Bossk. I really like the idea of the shotgun being able to use all its surge abilities against a nearby figure. I could see a mini campaign about rescuing abducted people from a wildlife preserve that mercenaries are using to hunt people. An updated version is in the Homebrew characters thread. It would be possibly a good place for your ideas too as it is a widely read thread. Ideas about the character itself are very welcome. There are few niktos in star wars and trandoshans die quite often(hunting wookies isn't good for health i guess). Rampage: You may suffer 2 damage while attacking to become able to spend surges on your Cleave target and to use the same surge up to twice, but only once/target. Bodyguard: At start of each round give a friendly Unique the master token or place it next to the board. When the Master is adjacent he gets +1surge/evade. (When he is defeated you activate instantly, then you are also defeated).When the Master suffers at least 3 damage you may move two spaces and attack the damage's source (with +1 surge). Then you choose of getting stunned and weakened or attacked by that enemy. Limited once/activations. Very cool! I love the tactical options and decisions that would arise from it ? I quite like this idea. How about a special action "Load/Unload" that allows it to "gather" friendly Imperial figures within 2 spaces and load them into figure slots, or drop them within 2 spaces, if they are already loaded? Oh perhaps Mobile, making them useful on maps with lots of difficult terrain. Don't massive figures already ignore difficult terrain? They ignore impassable and blocking terrain. So, they still have to spend the extra pt to enter difficult terrain, they just don't have to do it for every single space that enters.